North Atlantic Books, 9781583949030, 240pp. With the rise of urban living and the digital age, many North American healers are recognizing that traditional medicinal knowledge must be recorded before being lost with its elders. A Cree Healer and His Medicine Bundle is a historic document, including nearly 200 color photos and maps, in that it is the first in which a native healer has agreed to open his medicine bundle to share in writing his repertoire of herbal medicines and where they are found. 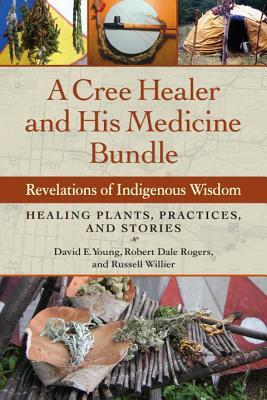 Providing information on and photos of medicinal plants and where to harvest them, anthropologist David E. Young and botanist Robert D. Rogers chronicle the life, beliefs, and healing practices of Medicine Man Russell Willier in his native Alberta, Canada. Despite being criticized for sharing his knowledge, Willier later found support in other healers as they began to realize the danger that much of their traditional practices could die out with them. With Young and Rogers, Willier offers his practices here for future generations. At once a study and a guide, A Cree Healer and His Medicine Bundle touches on how indigenous healing practices can be used to complement mainstream medicine, improve the treatment of chronic diseases, and lower the cost of healthcare. The authors discuss how mining, agriculture, and forestry are threatening the continued existence of valuable wild medicinal plants and the role of alternative healers in a modern health care system. Sure to be of interest to ethnobotanists, medicine hunters, naturopaths, complementary and alternative health practitioners, ethnologists, anthropologists, and academics, this book will also find an audience with those interested in indigenous cultures and traditions. DAVID EARL YOUNG spent much of his childhood in Sierra Leone, West Africa. After returning to the U.S., he graduated with a BA in sociology and philosophy from the University of Indianapolis, followed by a BD in religion and anthropology from Yale University, an MA in Asian Studies from the University of Hawaii, and a PhD in anthropology from Stanford University. Dr. Young taught anthropology for many years at the University of Alberta in Canada before retiring to take a teaching position at Kansai Gaidai University in Japan. He has conducted fieldwork in Mexico, Japan, China, and northern Canada. Dr. Young and his wife are retired and living on the island of Gabriola, off the west coast of Canada. ROBERT DALE ROGERS, BSc, RH/AHG, FICN, has been a student of native plants and fungi from the Canadian prairies for more than forty years. He is a retired clinical herbalist, amateur mycologist, and professional member of the American Herbalist Guild. Rogers is an assistant clinical professor in family medicine at the University of Alberta. His over 20 books and ebooks may be found at www.amazon.com/author/robertdalerogers. They involve the traditional use of plants and fungi of the boreal forest with special attention to application by aboriginal healers. Rogers teaches plant medicine at Grant MacEwan University and the Northern Star College of Mystical Studies in Edmonton (www.northernstarcollege.com). He is a consultant to the herbal, mycological, and nutraceutical industries, is currently chair of the medicinal mushroom committee of the North American Mycological Association, and is on the editorial board of the International Journal of Medicinal Mushrooms. Rogers lives in Edmonton, Canada with his wife, Laurie. You can visit their webpage at www.selfhealdistributing.com. RUSSELL WILLIER was born on the Sucker Creek Reserve in northern Alberta. He grew up in a large family of twelve brothers and sisters. His father was a skilled hunter and trapper who passed his knowledge about the traditional Woods Cree way of life on to his son. Willier attended Catholic mission school but quit in order to help his parents on the family farm. Even at an early age, Russell showed signs of having been selected by the Spirit World to be a healer, but he resisted for many years. Eventually, he accepted this responsibility and received the medicine bundle of his great grandfather, Moostoos, a well-known healer in the area and signer of Treaty 8. By the time Willier received his medicine bundle, the knowledge of how to use the little plant packets inside it had been lost, so Russell showed them to elders and asked if they knew how these “combinations” were used. Gradually, over many years, Russell pieced together the information he needed to begin practice as a Medicine Man. Willier, who still lives on the Sucker Creek Reserve, travels extensively to treat those who call upon him for help.